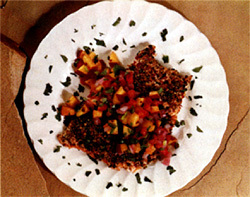 Recipe for Pepper Crusted Salmon with Fruit Salsa from our Main Dishes recipe section. Recipe for Tomato-Rosemary Chicken from our Main Dishes recipe section. 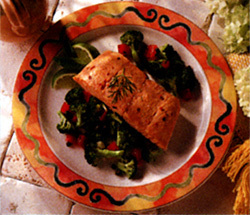 Recipe for Pacific Ocean Salmon with Fresh Vegetables from our Main Dishes recipe section. Recipe for Superfast Picnic Chicken from our Main Dishes recipe section. Recipe for Bombay Chicken from our Main Dishes recipe section. Recipe for Cheese Lasagna from our Main Dishes recipe section. This salad keeps for 3 days in a glass (not metal) bowl in the refrigerator, if well covered. Recipe for Doug’s Flower Power Caesar Salad from our Main Dishes recipe section.